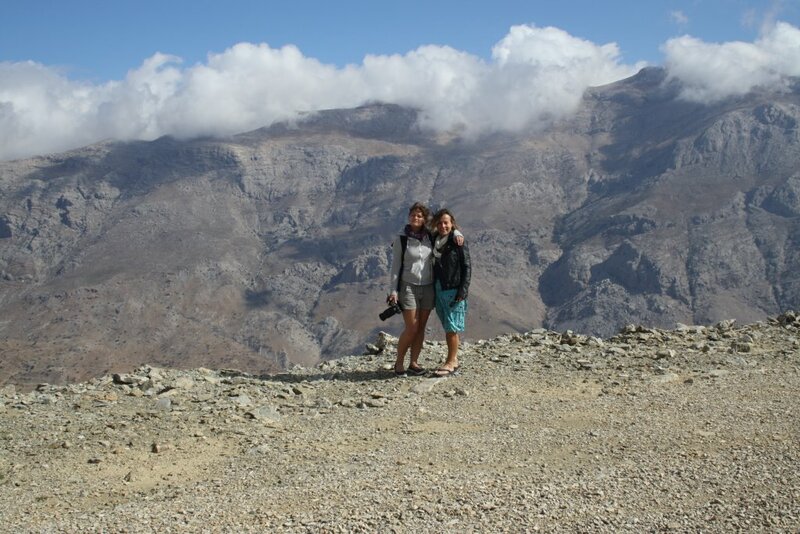 More than fifteen years ago now, we went to the North coast of Crete on a package tour. One day we hired a car and stopped at a petrol station to fill up. When the Greek guy on the pumps asked us where we were going, I held up our tourist map and pointed to a beach on the south coast recommended by a guide at the hotel. He took the map from my hands, whipped a biro from behind his ear and drew a blue wiggle where the map was completely blank, just south of Spili. And so we discovered, by chance, a stretch of coast just south of Spili to which we have returned at least once every year. This is why: we return because we fell in love with rugged mountains, thyme, sage and carob trees clinging to rocky slopes which give way – here and there – to the gravelly scoop of an isolated beach; we fell in love with air which smells of sunbaked earth, aromatic with mountain herbs, and with the night skies thick with stars. 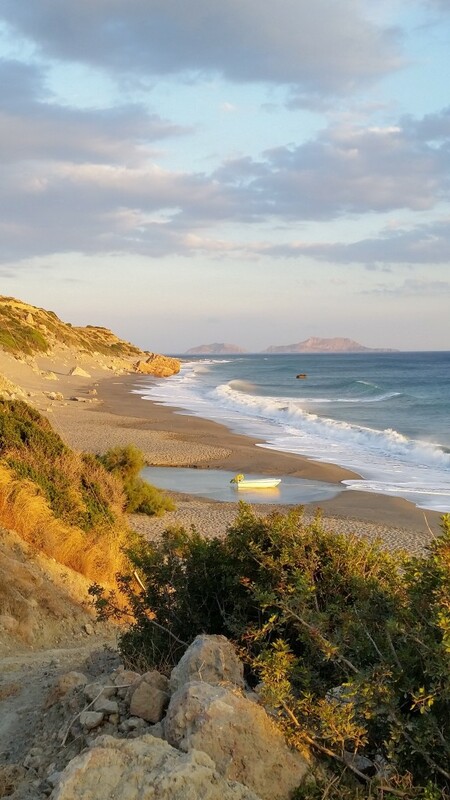 We fell in love with remote tavernas nestled at the end of dirt tracks or tucked into the shelter of a craggy corner, perhaps built around an ancient carob storehouse or a stone fisherman’s hut, buildings often owned by the same local family for generations. We fell in love with the place and the people we met there. 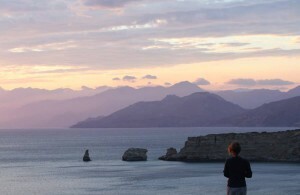 This is Akoumia beach, to the east of the Triopetra rocks which provide the striking landmark for this stretch of coast. That first day, we were the only people on this beach; the only people at Apanemia taverna for lunch. The taverna had recently opened, a new venture for the Koumandakis family. Stelios and his mother fed us with delicious octopus in red wine sauce and rabbit stifado, brought us chocolate biscuit cake to taste and gave us raki made from their own grapes. They welcomed us as if we were friends, and we were charmed. 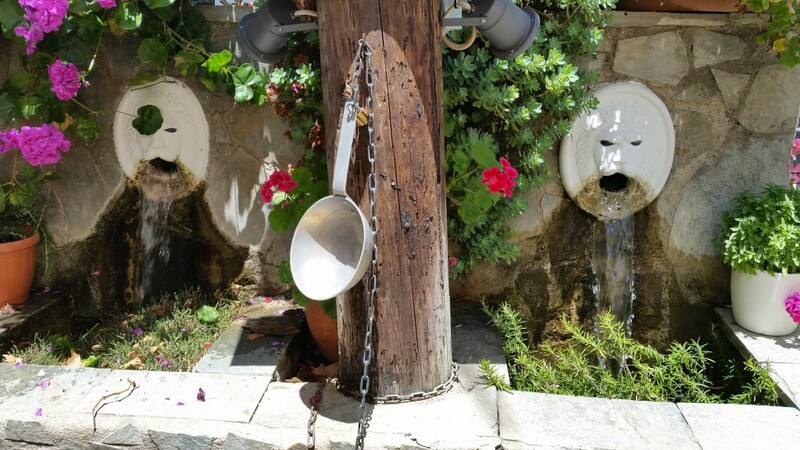 Kindness and generosity are what Cretans in these mountain villages and tavernas give to strangers, always offering food or drink, pressing gifts of their own wine and homegrown produce into our hands. Even Rula, the lady who owns the supermarket where we often shop in Spili, about 25 minutes drive from the coast. Since that first drive down to the south coast, we’ve often headed straight for Trioptera from the airport in Heraklion. Once there, we read, swim, read, wander along the empty beaches, eat, read… You get the picture. We also explore the dirt tracks up the mountain or along the coast and get lost. We wander around remote mountain villages and drink in their kafeneons. Lately we have been out of season, in January, March, November, and driven to the east and west as well as the south, armed with history books and decent maps. 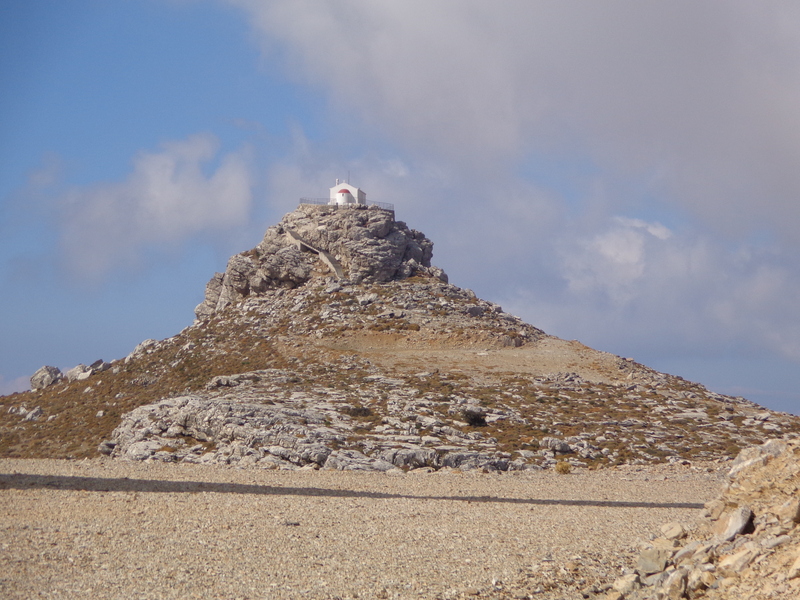 Many magical places are close by, places like Akoumia church, built by the villagers right on the top of the mountain. There are the narrow backstreets of Spili and the fertile Amari valley where we once saw a golden eagle swoop down onto its prey in a field close by. 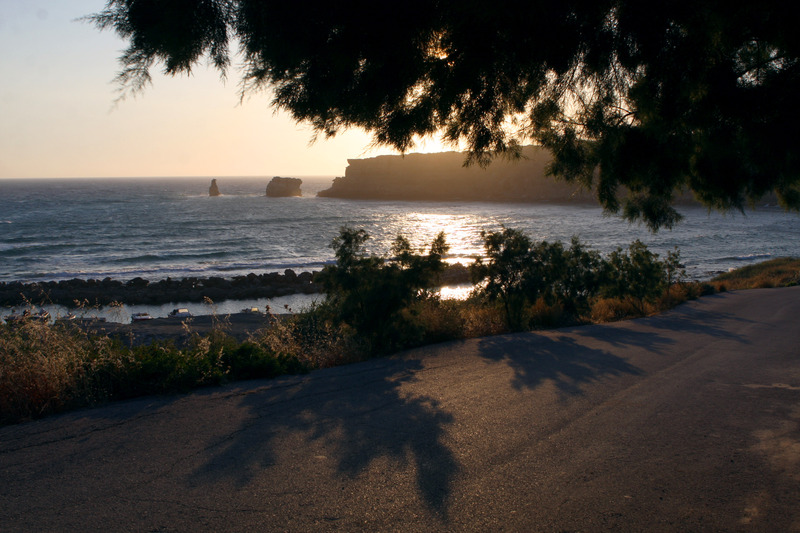 A little further away you’ll find picturesque Rethymno with its Venetian harbour and fortress, the Minoan Palace at Phaestos and the Roman cemetry at Matala, where hippies lived in the 60s. Over the years more and more people have ‘discovered’ the joys of this area of the south coast. As well as the Greeks who flock there in August, in the quieter months you might meet Belgian, French, German, Austrian and a few other British tourists. Many return, as we do, year after year. Think you might want a trip out there? 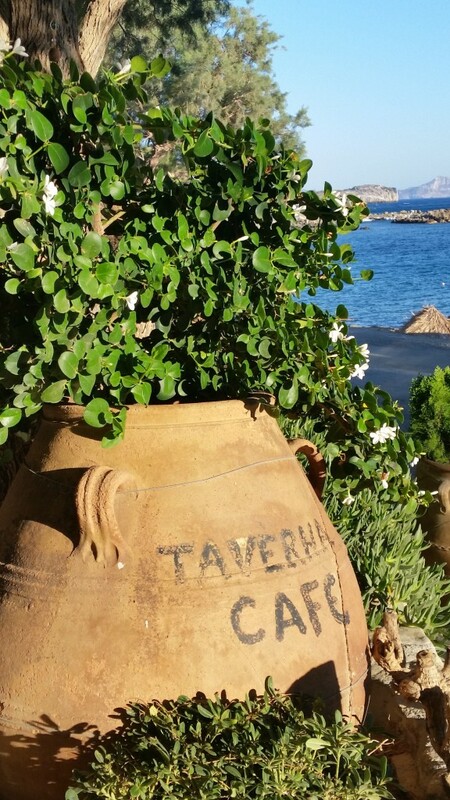 Apanemia Taverna – number one on the list – run by the Stelios, his wife Georgia and brother Stavros. Here, you sleep to the sound of the sea, within a few steps of the beach . 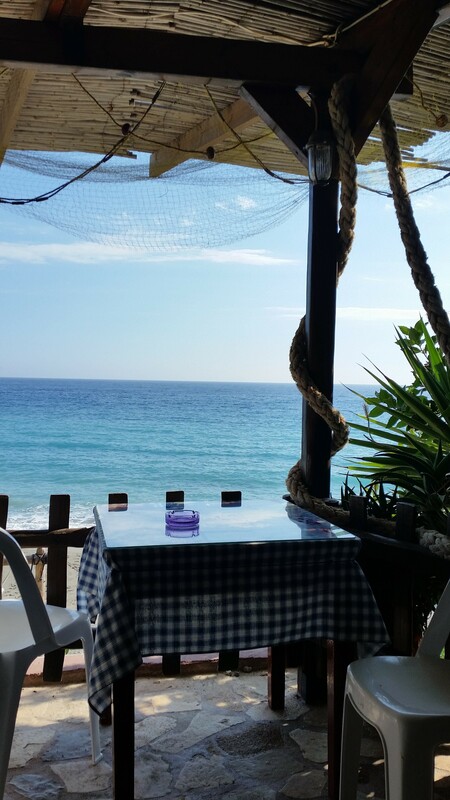 . .
Agia Fotini taverna, with its turquoise shutters and tables, often serves fresh fish and is so close to the sea that on a windy day, your food is seasoned with salt spray. They have a lively Facebook page , and you can read a Guardian article which captures the atmosphere of this special place, here. Ligres : with its lush river valley and terraced taverna looking down over a long, empty beach. 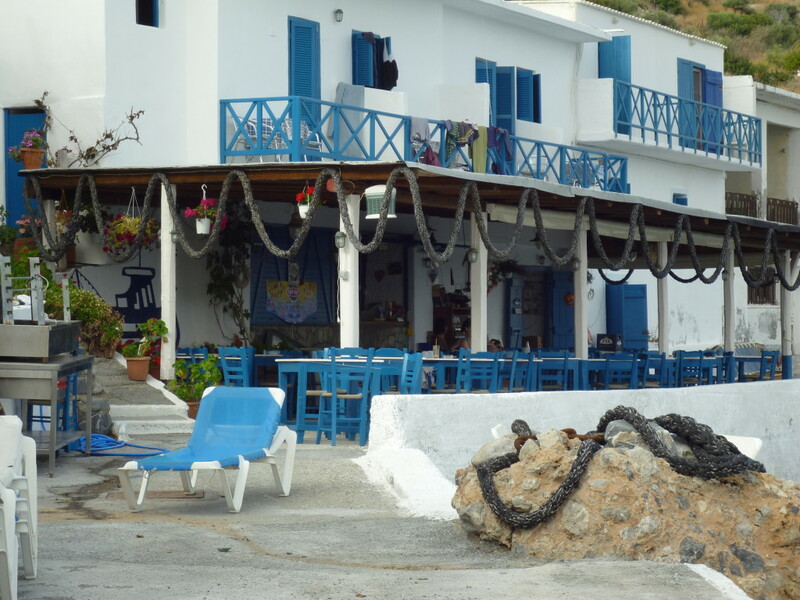 The tavernas at Apanemia, Ligres and Agia Fotini are all family-run and very friendly, serving delicious, traditional Greek food. All three have just a few rooms. We’ve stayed here, in Agyro’s House, more than once. 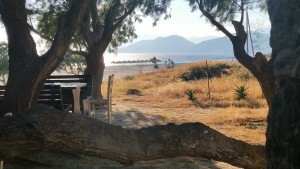 Between the village of Akoumia and the beach at Triopetra are the well equipped Paterakis Studios , great if you like to self-cater and prefer a spacious room. And here, there’s also a swimming pool. 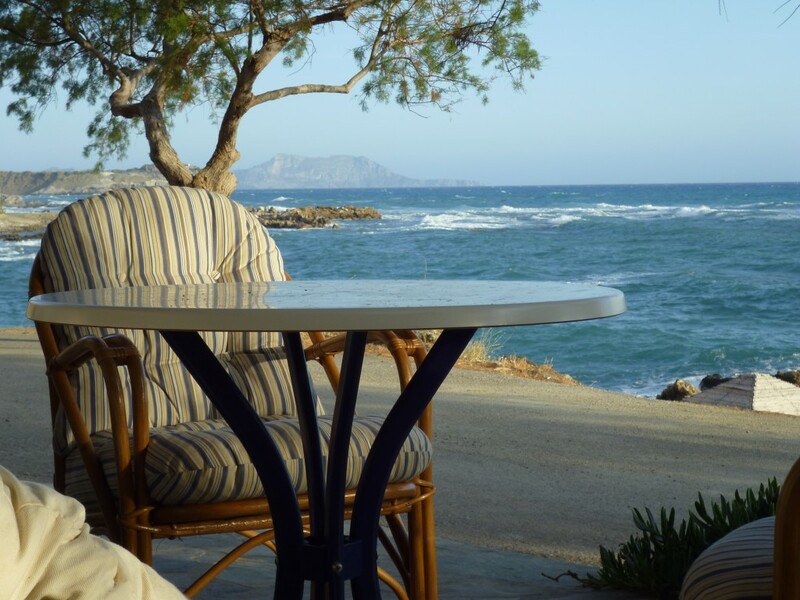 And the beautiful Notos Apartments, within 20 minutes walk of the beach. 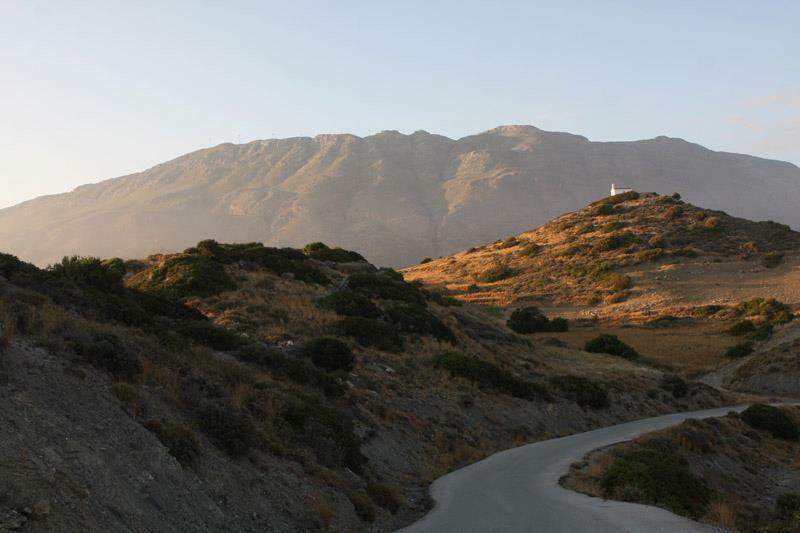 For accommodation all year round in this part of Crete, you can stay in Spili, a traditional village in the foothills of Mount Vorizi.  l Polymia Villa , a restored house in the old part of the village, perfect for groups of friends and families. At Heracles , also in Spili, you’ll find rooms with the most comfortable beds and wake to a delicious breakfast in the morning. Heracles is very popular with walkers in Spring and Autumn. 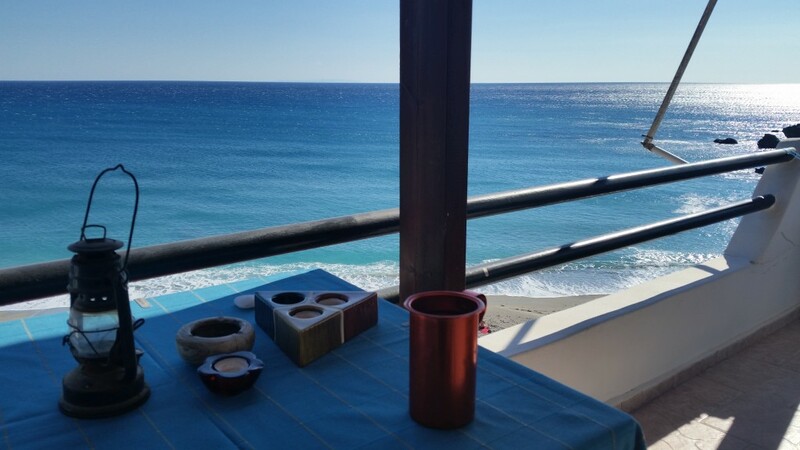 A friend recently enjoyed 3 weeks holiday in this part of Crete, staying in Agia Fotini. 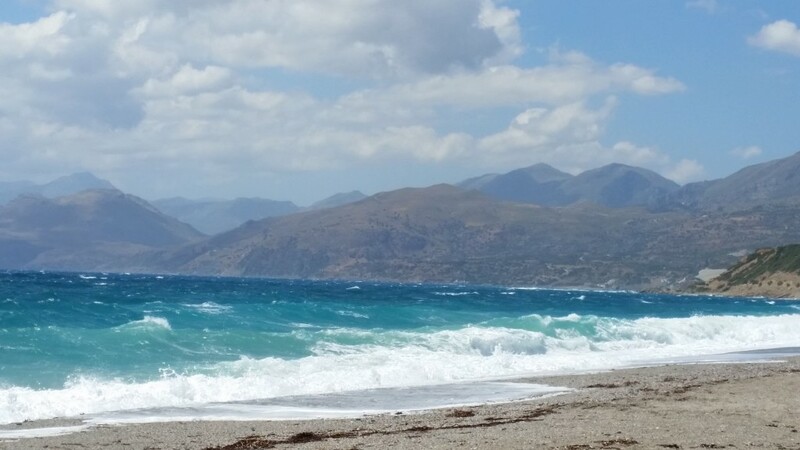 She came home and announced on facebook: ‘Crete is good for the soul’. That pretty much sums it up. With thanks to Nat Miller for all the best photos here. If you’d like to use any, please run it past us first via the contact form on this website. Thank you!